The list of leading outbound and inbound tourism companies in Dubai includes the name of Arabian Desert Tours (ADT), as this company is providing excellent services since July 13, 1996, when it’s first ever office was set up at New Al Safiya Building, Abu Hail-Deira, Dubai. The mix management of the Arabian Desert Tours (ADT) that comprises of both local and western people gives it an edge over others, as they have better understanding of various heritages, traditions and most importantly languages. On top of it, their custom designed tours are developed by bearing the special requirements of both corporate and individual persons in mind which also helped them in drawing more clients. Moreover, ADT also offers wide array of excursions in Dubai and its surroundings which has eventually made this a successful venture. Arabian Desert Tours offers custom-made tours along with regular excursion trips so their each client, whether he or she belongs to the corporate world or an intimate group, should get their own personalized services. This set of services include breakfast, lunch, afternoon tea & dinner in Burj Al Arab, morning dune drive, sand surfing, camel ride, fishing, cruising trip, overnight desert safari, Fujeirah East Coast tours, Dhow dinner cruises, Sharjah & Ajman tour, Abu Dhabi City tour, Mussandam tour, Al Ain City tours, Hatta Mountain trek, hot air balloon, quad bikes safari, helicopter tours, Wild Wadi tours, Dubai City tours, crab hunting, desert safari, conferencing and meet & greet services. Aside from these services, ADT also make flight arrangements, visa arrangement, organizes events, charter yachts, provide airport transfer, reserve accommodation facility and offer guiding tours. Arabian Desert Tours opens daily and its usual opening hours are from 9:00 am to 7:00 pm. New Al Safiya Building, opposite Ramada Continental, Deira, Dubai, United Arab Emirates. 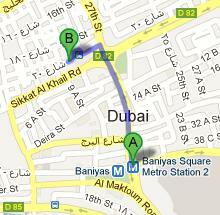 Baniyas Square Metro Station 1 is 10 minutes walk and 750 meters journey from Arabian Desert Tours’ office in Deira, Dubai. To get to this office from Baniyas Square Metro Station 1, patrons should head north on 27th Street towards Al Maktoum Hospital Road, then turn left towards 27th Street and after that make a right turn onto 27th Street. This will bring the patrons to a left turn that goes towards 17th Street, from where pedestrians have to turn left towards 17th Street in order to make another left turn onto 17th Street, so when the 17th Street turns right and becomes 20th Street they will finally reach the destination. Naif, Police Station – Dubai bus stop is 220 meters journey and 3 minutes walk from Arabian Desert Tours work place in Deira, Dubai. So people can use bus numbers 4, 10, 11A, 13, 13A, 13B, 13D, 64, 64A and C5 to get to this bus stop, as it is situated quite close to this tourism company’s office. All bus users need to do is to head in the southwest direction on Sikkat Al Khail Road/D 82 towards 9 A Street, after landing at this bus station and then turn right towards 20th Street. This will lead the bus user to another right turn that goes onto 20th Street, where their destination is located. View map for directions.